Franz Joseph Haydn, (born March 31, 1732, Rohrau, Austria – died May 31, 1809, Vienna), was an Austrian composer, one of the most prolific and prominent composers of the Classical period. He was among the creators of the fundamental genres of classical music, and his influence upon later composers is immense. Ludwig van Beethoven was his most celebrated pupil. Haydn is sometimes called the father of both the symphony and the string quartet. He wrote 107 symphonies in total, as well as 83 string quartets, 45 piano trios, 62 piano sonatas, 14 masses and 26 operas, amongst countless other scores. His most famous choral works are the oratorios The Creation (Die Schöpfung) (1798) and The Seasons (Die Jahreszeiten) (1801). Joseph Haydn, in full Franz Joseph Haydn, was born in Rohrau, Lower Austria, on March 31, 1732. His father, Mathias Haydn, was a wheelwright, his mother, Maria Koller, before her marriage, was a cook for the lords of the village. Haydn showed immediate musical precocity and at the age of 5 was given into the care of a Hainburg schoolmaster called Franck, who taught him the rudiments of music. At age of 8 he was recruited to sing in the choir at St. Stephen’s Cathedral in Vienna, where he went on to learn to play violin and keyboard. He remained a pupil at St. Stephen’s for almost ten years. Haydn made his first attempts at composition; his early works included a Singspiel entitled The Lame Devil (Der krumme Teufel) (1752), a few keyboard sonatas and trios, and his first string quartet, written during the 1750s. Haydn was appointed to the small musical establishment of Count Morzin in 1759. His first symphonies as well as his earliest string quartets date from this period. His name and compositions steadily became recognizable. Haydn stayed only briefly with von Morzin, as financial difficulties forced his patron to dismiss the orchestra. 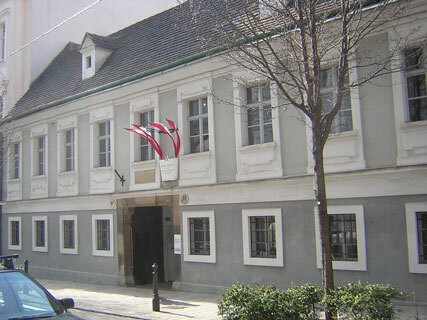 In 1761 Haydn entered the private service of the Esterházy family in Eisenstadt, serving under Prince Paul Esterházy and then, on his death in 1762, under Prince Nicholas. The Esterházys were one of the wealthiest and most-influential families of the Austrian empire and boasted a distinguished record of supporting music. Haydn, in his capacity as Vice-Kapellmeister (1761–1765) and later Kapellmeister (1761–1790), was in charge of supervising, if not composing, the music performed at the prince’s palace at Esterháza. Prince Nicholas Esterházy (18 December 1714 – 28 September 1790) was a Hungarian prince, a member of the famous Esterházy family, Haydn’s most important patron. There Haydn was responsible for providing both vocal and instrumental music, including operas performed in the prince’s lavish theatre. 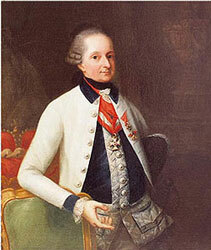 He remained in the Esterházy service until 1790. In 1781 Haydn frequently visited Vienna in the prince’s retinue, and on these visits a close friendship developed between himself and Wolfgang Amadeus Mozart. They admired each other’s music beyond that of any other contemporary. Mozart declared that he had learned from Haydn how to write quartets and in 1785 he dedicated a superb set of six such works to his friend. Haydn’s music, too, shows the impact of his young friend. The mature composer was by no means set in his ways; he was flexible and receptive to new ideas. In this decade Haydn produced about 20 symphonies, including the 6 Paris Symphonies, Nos. 82-87 (1786), and the Oxford Symphony, No. 92 (1788). He also produced the 25 quartets constituting Opus 33 (1781), “written in a new and special manner”; Opus 42 (1785); Opus 50 (1787); Opus 54 and Opus 55 (1789); and Opus 64 (1790). Haydn visited London twice in 1791-1792 and 1794-1795. In 1792 he returned to the Continent, passing through Bonn, where he met the young Beethoven, who became his pupil in Vienna. In 1794 he returned to London for another successful tour. Haydn spent four years in London composing music and experiencing life outside the royal court. In these years of his travels to England, Haydn, already in his sixties, produced many of his finest late works: his 12 last and greatest symphonies, Nos. 93-104, called the London Symphonies, and the last of his piano trios and piano sonatas. His time in London was the high point of his career. He earned nearly 24,000 gulden in a single year (the sum of his combined salary of nearly 20 years as Kapellmeister). He composed The Creation (Die Schöpfung), with a text by Gottfried van Swieten based on English sources, first performed in Vienna in 1798. The Seasons (Die Jahreszeiten), with a text by Gottfried van Swieten based on James Thomson, was first performed in 1801. 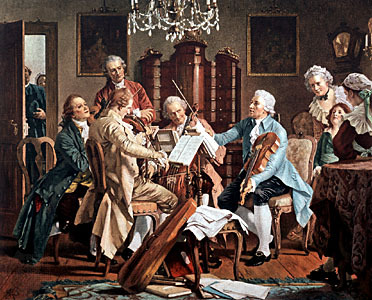 Joseph Haydn conducting a string quartet. 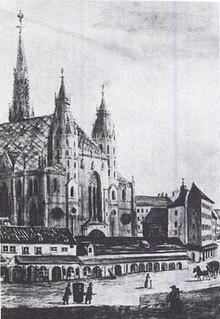 Haydn returned to Vienna in 1795 and took up his former position with the Esterházys, although only part-time. At this point, he was a public figure in Vienna, and when he wasn’t at home composing, he was making frequent public appearances. Haydn spent the last years of his life in Vienna composing only vocal pieces such as masses and oratorios. 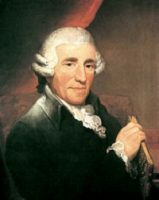 On May 31 Haydn died peacefully at the age of 77, and he was buried two days later. Mozart’s Requiem was performed at his funeral.